Promoting awareness-raising on organic agriculture among farmers across communities in Cyprus. The project was launched in October 2003 and completed in March 2004, with funding from the Bi-communal Support Program of the US Embassy. The aim was to produce an information leaflet on organic agriculture, supporting the efforts for promoting organic agriculture among the farmers of both communities of Cyprus. Cyprus, like all Mediterranean countries, has the ideal climatic conditions for the development of organic agriculture. Nevertheless, until now very few steps have been done in this direction. In the Greek Cypriot community the organic producers are straggling by themselves to find their way to cultivate, to process, to certify, to enter the market. The support from the Government was (until now) very limited, although organic agriculture is strongly promoted by European Union. In the Turkish Cypriot community, organic agriculture has not started yet, it does not exist. Luck of information on organic agriculture is a major drawback in the development of the organic sector in Cyprus. The wide distribution of the information leaflet produced under the current project is contributing in filling this gap. Organic agriculture is very important for public health, for the environment and for the local economies. The main objective of the project was to provide support to the efforts of promoting organic agriculture and giving information to the farmers, indicating the potential and the benefits form shifting from conventional agriculture to organic. The information leaflet is a starting point for people that would like to be involved in organic agriculture and production. It also gives the potential for further discussion with farmers, support from the authorities and the consumer society. The project beneficiaries were mainly the farmers, but also the agriculturalists, the environmental and social NGO’s, the competent governmental departments, the Consumers Associations, and the Mass Media from both communities. A 16 pages leaflet was produced, half in Greek and half in Turkish in 2000 copies. The leaflet informs the farmers and the public in a simple language on what is organic agriculture, the EU policies and legislation, the funding opportunities in Cyprus and the European Union and the existing sources of information. The information leaflet produced within the framework of the current project was distributed to a wide range of people. Bicommunal workshop “Organic Agriculture: A challenge for Cyprus”. 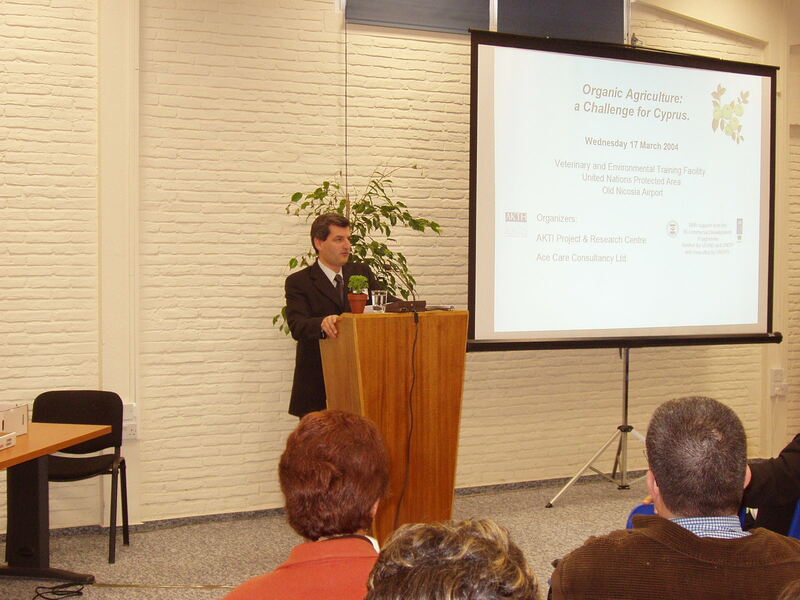 The information leaflet was distributed to the participants of the bicommunal workshop titled “Organic Agriculture: A challenge for Cyprus” that took place on 17th March 2004 in the Old Nicosia Airport. More than 120 people turned up for the workshop supported by the Bi-communal Development Programme (BDP), which is funded by USAID and UNDP and is executed by UNOPS. The workshop brought together farmers, scientists, representatives of civil society and civil servants concerned about a sustainable future for farming in Cyprus. Organic farming was presented as an environmentally sustainable solution, which would be relatively easy to implement on the small-scale Cyprus. Pancyprian meeting of organic producers. The Leaflet was distributed during the Pancyprian meeting 2004 of the Organic Producers Association of Cyprus to all the participants. In addition the leaflets were sent to competent governmental Authorities, Local Authorities, T/C and G/C environmental and social NGOs, Consumer Associations, Youth Board of Cyprus and Mass Media.